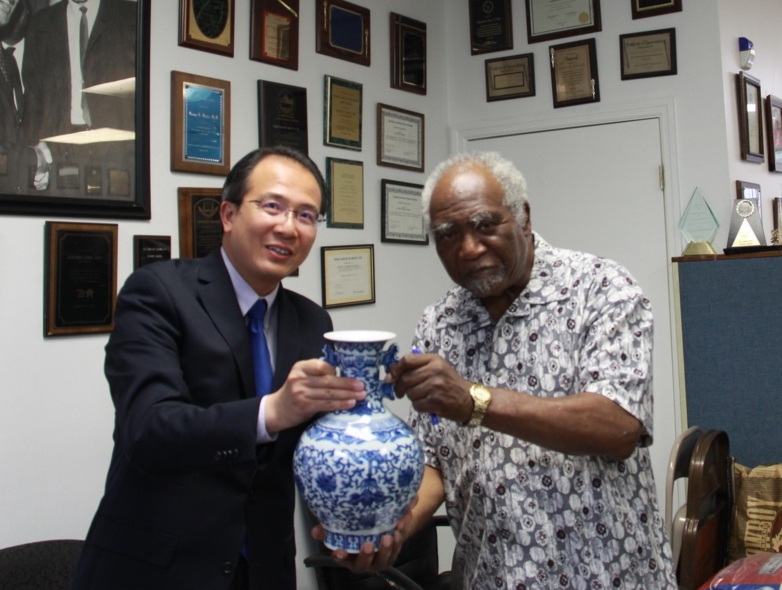 On August 28, Consul General Hong Lei met with Congressman Danny Davis in Chicago. Consul General Hong Lei said that in recent years, China’s relationship with Illinois has maintained a good momentum of development, yielding fruitful achievement. China is Illinois’ second largest trading partner, the second largest sources of imports, as well as the third largest destination of exports. In 2016, the state of Illinois became the third largest destination of Chinese investment in the United States. Congressman Davis’ 7th Congressional District of Illinois ranked second among all congressional districts in the US in terms of attracting Chinese investment. By 2016, the 7th District has received 4 billion dollars worth of investment from China which generated 2,160 jobs. China appreciates Congressman Davis’ continuous interest in and strong support for the development of overseas Chinese community. Consul General Hong Lei hopes that Congressman Davis can lend continuous support to the development of Sino-US relations, as well as China’s cooperation and exchanges with the state of Illinois. Congressman Davis said he has always had friendly feelings towards the Chinese people, adding that the Chinese community which he represents is the most active community in the 7th District. Congressman agreed that the U.S.-China relations are very important, and he hopes that the two countries will continue to strengthen exchanges and dialogue in various fields and enhance coordination in international affairs.